This time of year finds me running in three different modes – getting seeds started for the garden, keeping schoolwork progressing, the house from becoming a disaster and planning for our next school year. I go through 5 steps to plan a school year. I start with an overview and then take this framework to plan books, supplements, and electives. 5 steps to plan a school year – Let’s get started. I work better off paper, but this can be done on any word processor as well. I also tend to start this process a small piece at a time in the odd minutes I have while the kids are working. 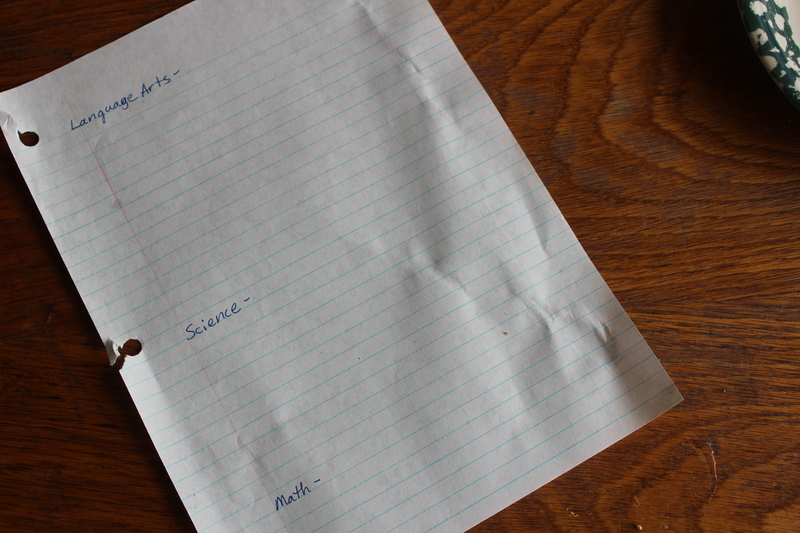 My first step is to take a blank sheet of notebook paper. I then write down main subjects leaving a good space between them. Usually, I list 2-3 subjects on one side of a sheet. This leaves me room to list each child with space to list books as well. This year I have three to plan for. One in high school and 2 in elementary. Main or core subjects for me are usually Language Arts, Math, History, Science, and Bible. 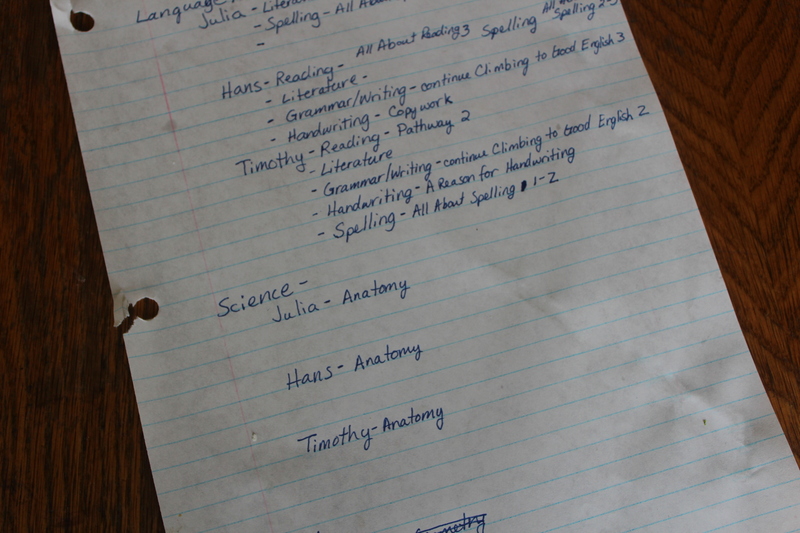 Language Arts will have subheadings for Reading, Grammar/Writing, Handwriting and Spelling. 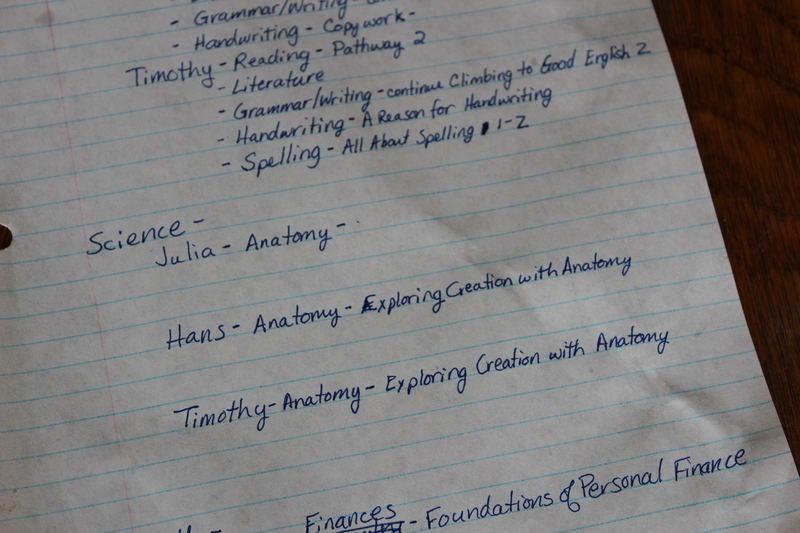 I then add each child of school age (usually oldest to youngest) to the lines underneath each subject. 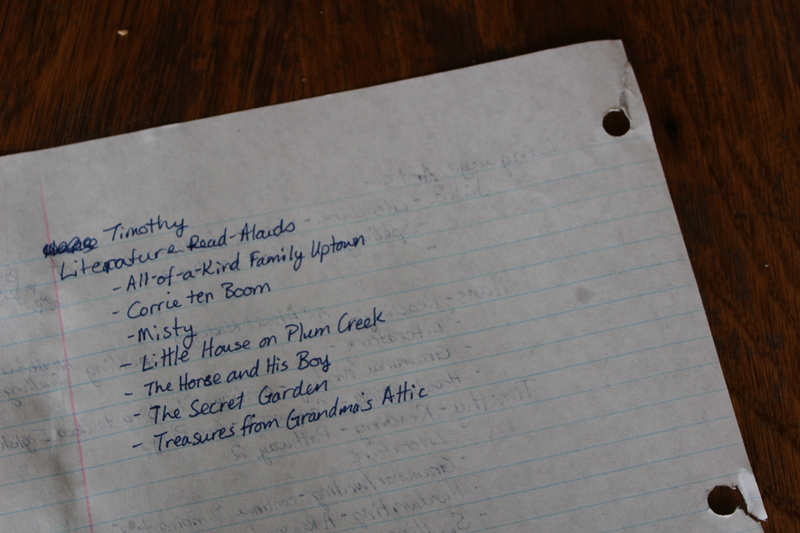 Now, I go back through the list and add a more details to the subjects. For example, under Science I might list Anatomy or Biology. This depends on the child, what they’ve studied already, their age and what and where they need to work next. This year was the second year my high school age daughter work on Biology. We made the decision after starting it that we needed to slow way down for her to retain the material. As a result she spent 2 years working through the Biology course. 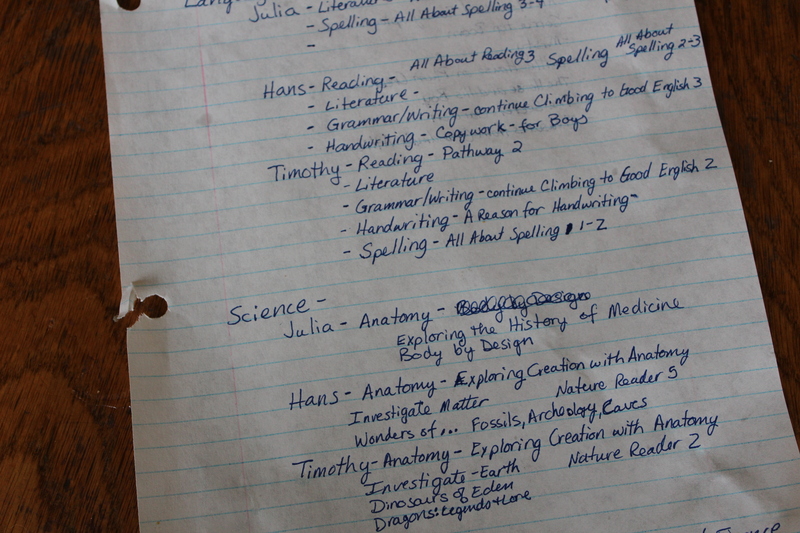 At this point, I also list any other subjects that would be considered outside the core subjects. These would include Art, Music, PE, foreign languages, Psychology, Philosophy, and Logic to name a few. The elective options are limitless. At this point, I will then go through my list and start adding specific books. This would be the main book I want to use for each subject and child. This can be my most time consuming process. 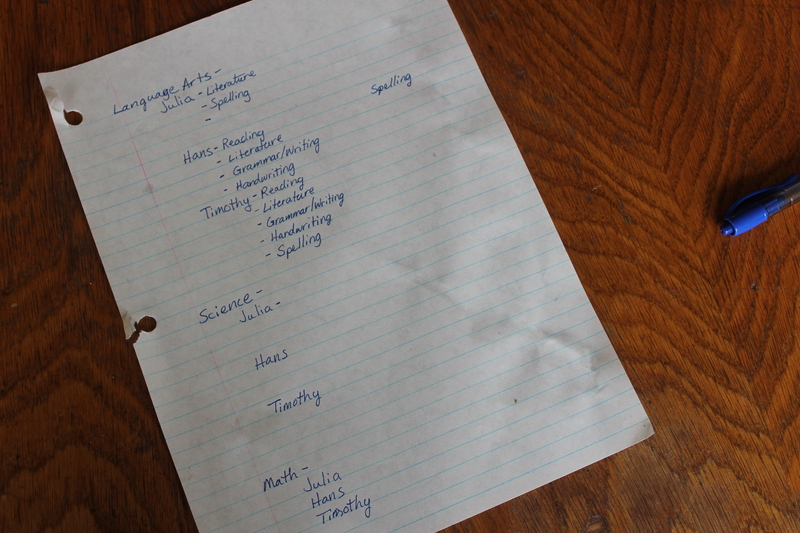 I have been homeschooling for 17 years and I do have favorites I reuse again and again. I have a cycle for most subjects. At the same time, I also continue to watch the new options available and as I can or is necessary I buy new books that will work better for us. Ideally, this is the point to plan for the changes, instead of making a complete change in curriculum part way through a year. However, as homeschoolers we have greater flexibility to make those changes at whatever point is needed. This last year, I had to change the reading program I was using with my 5th grader. It was a good change and has helped his reading greatly. This step is where I fill in any supplemental books I want to add to each subject and can also be time consuming. These can be books I have assigned or books I add to their book basket. This is also the point at which I will sort through the read aloud options for each child. I include with my planning for Language Arts and History a selection of read alouds. These are books I read aloud to them usually 5-10 pages daily. For supplements that are assigned I plan for about 3 pages daily. From here I create a new list. 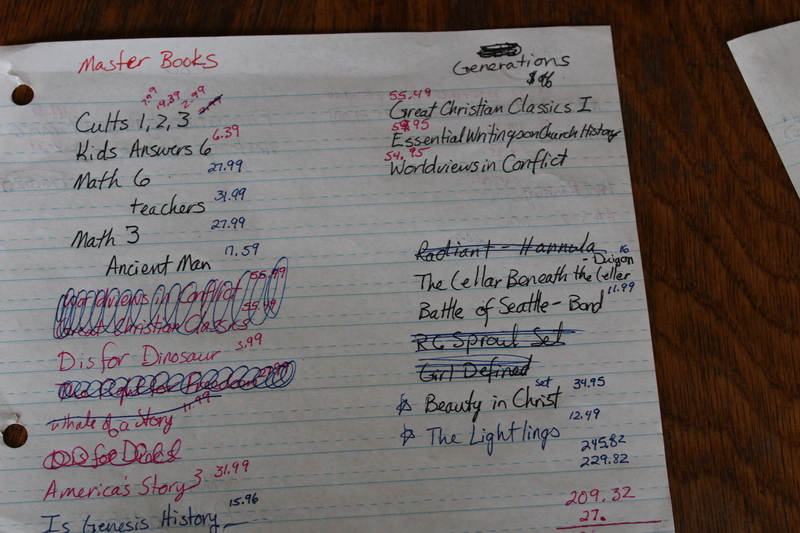 First I go through the layout list and highlight, circle or mark some other way the books I need to buy. I start on a clean sheet and I will group the books according to where I want to buy them. I also add prices. This make it easier to do my ordering and not miss something. By adding the prices, I can add it up and see how much it is going to cost. Depending on the year and what I have to spend, I then start removing supplements and any extras. This make it easier to do my ordering and not miss something. The reality is some of these steps do bleed into the next at times. For example, as I’m deciding on a main book to use (step #3) I will also at times add selections to the supplemental list (step #4). But the basic layout is always about the same. I don’t tend to keep these sheets once I purchased any new books and created my basic lesson plans for the year. Was this helpful? Are there other steps you include in your planning? Leave your comments below. You know, I’m still considering myself new to this business homeschooling. I’m a public school girl. I’m learning as we go. I’m very thankful for you who offer your knowledge and experience. I plan by subject and child as well. Trying my best to keep it as simple as possible. A math curriculum that works for a variety of learners… a reading plan that teaches well the different learning styles… History and science all the ages can do together (for now). My readers are getting lots of reading in. But I’m struggling to get the read-out-louds accomplished especially with the three year old needing extra one-on-one reading/talking/speech “therapy” and the two year old who tears the house a part. And the nursing baby who also eats the whole contents of the floor. So, my focus is now figuring out what schedule/routine will work best to maintain sanity, productivity, and peaceful read out loud times. Any suggestions there are most welcome! When I was starting and my oldest were just starting, we didn’t get many read-alouds in either. I was doing well, if I got one in for everyone together. I became easier as the kids grew, but this year has been challenging with twins in the tear-the-house-apart stage. Wonderful work, Heidi. I am proud of you.